When spring rolls around I start thinking about entertaining. I love nothing more than an intimate dinner party with close friends. Cooking for people that I care about brings me so much joy. We’re having some of our best friends over for dinner on Saturday night and the forecast for Atlanta calls for a high of 78 degrees. This will be our first opportunity of the year to dine on our patio. When entertaining, I always like to start dinner with a salad that makes a statement. What better way to announce spring than to build a salad with than three spring vegetables: asparagus, radishes, and fava beans. These vegetables, all spring crops, make the perfect starter for this time of the year. I’ve used fava beans for this recipe, but if you don’t have access to them, fresh or frozen green peas work very well as a substitution. My previous post for Fava Beans with Red Onion, Pecorino Cheese describes how to prepare the beans. 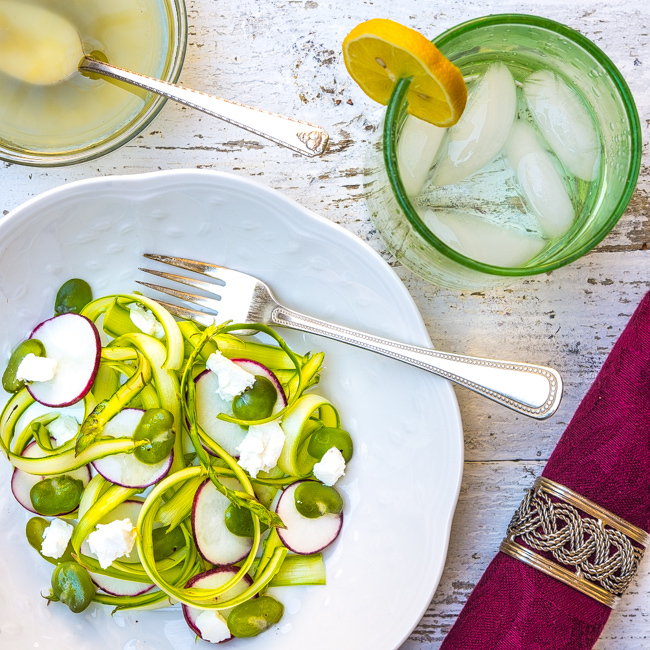 Today’s post not only features this delicious spring salad, but also an exciting giveaway package sponsored by Vermont Creamery, Calivirgin, JK Adams, and Effie’s Homemade. My blogger friend, Katie Webster, from Healthy Seasonal Recipes coordinated this group spring entertaining giveaway with several awesome bloggers. Check out their blogs by clicking on the links below. Prior to writing this post, I received generous packages of sample cheeses from Vermont Creamery. Included in the package were Goat Cheese Crumbles with Cranberry & Tarragon, Crumbles with Sun-Dried Tomato & Basil, Cultured Butter, and various other cheeses. I am not exaggerating when I say that the goat cheese from Vermont Creamery is some of the best I’ve ever had. I also received a olive oil sampler from Calivirgin. Included in the package were rosemary, garlic, and lemon flavored virgins as well as balsamic vinegar. The lemon infused olive oil enhanced the flavor of the vinaigrette in today’s salad. I highly recommend these outstanding olive oils from Calivirgin. Enter the giveaway below before April 16 at 12:00 noon EST. 1. Whisk lemon juice, mustard, salt, pepper, and thyme together in a small bowl. Drizzle in oil, whisking constantly until well combined. 2. To create asparagus ribbons, place spears horizontally on a cutting board and slice along the spear with a vegetable peeler.Toss asparagus ribbons, radishes, and fava beans in a medium bowl. Add dressing to taste and toss. Top with goat cheese crumbles and serve. What a light and perfect salad for spring! That dressing sounds so amazing! What a delicious salad Bill! Good luck to the giveaway participants. This is really just so gorgeous! Love the spring colors and goat cheese is such a favorite of mine! Such a nice salad — clear, direct flavors. And it looks so great on the plate! Really good stuff — thanks so much. What a wonderful salad-fava beans and pecorino are classic combo! I love sangria and cheese parties! Seriously… I could live on cheese. What a great, fresh looking salad! It’s stunning! And it was a ton of fun getting to do this giveaway with you! I am drooling over this gorgeous recipe!!! So glad to discover your blog!! I’m LOVING this salad, Bill — the colors are so fresh and springy and I love all the ingredients. So happy to be doing this giveaway with you!